This Lombardy city was founded around 400 BC by a group of Gauls known as the Insubres. Romans conquered the city in 222 BC and thereafter, it was annexed to the Roman Empire and given the name of Mediolanum, from which the name of Milan is said to directly derive. 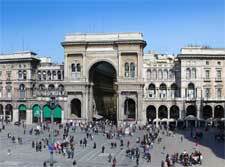 In 15 BC, under Augustus, Milan was made the capital of the region named Transpadania. Later, in the 3rd century AD, it was effectively the capital of the western empire. During this period of the city's history, Christianity took a strong hold. Indeed, many of the local churches have their origins in this time. From 313 AD, the city's earliest bishop, St. Ambrose, was duly appointed. When the Roman Empire went into decline in the 5th century, Milan's position was considerably weakened. In 539 AD, the Lombards invaded the city and 30 years later, they succeeded in taking control. The city had to wait until the 8th century AD before it could witness a revival in its fortunes. Gradually, a series of alliances led to the bishops of Milan becoming more and more powerful. Eventually, in 1000 AD, the clergy were more or less the rulers of many Italian cities, including Milan. Here, much power was vested in its archbishop. 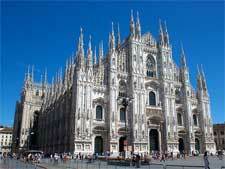 By the first quarter of the 12th century, Milan was a municipality, removing the archbishop from the political scene. Democratic laws were established in the city. In the early 13th century, it became a 'seigneury' (feudal lordship). New city walls were built, along with various buildings and city streets. Democratic government came to an end in the 13th century, when power in Milan was seized by one of its oldest families, the Viscontis. They ruled here until 1447, at which time the last duke died. During their long reign, the Visconti family established stability in Milan, ushering in a period of peace and prosperity. A republican government took charge of the city's affairs. It was to be a short-lived situation and by the middle of the 15th century, Francesco I Sforza had taken control. This was the time of the Renaissance in Italy and Francesco was to take full advantage of the creativity and innovation that it spawned. Milan was transformed into a powerful metropolis, with its Castello Sforzesco (Sforza Castle) and the Ospedale Maggiore (Ca' Granda). The Duomo dates to this point in the city's history as well. Under Ludovico Sforza, Milan also grew in importance because of its silk industry. Leonardo da Vinci came to Ludovico's court and at that stage, the city ranked amongst the country's leading hubs for art and culture. In 1535, Charles V came to the throne and Milan embarked on almost 200 years of Spanish rule. The events of these years are narrated in a book written by Alessandro Manzoni, entitled 'I Promessi Sposi', or 'The Betrothed'. 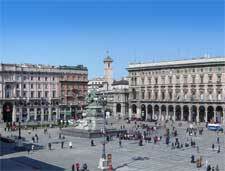 In the early 18th century, the Austrians took over in Milan and as a result, the city underwent a rapid transformation. La Scala Theatre was built and most notably, Giuseppe Verdi was to grace the stage with his earliest performance here. Other new neoclassical buildings included the Arco della Pace. Then, in the mid-19th century, the Austrians were driven out of the city. The city was annexed to the Kingdom of Piedmont, which later became the Kingdom of Italy in 1861. Milan was chosen to be its capital city. The end of World War One brought peace to the city, but little in the way of prosperity. A noticeable lack of food and increasing unemployment led to social discontent at this time in local history. Mussolini's Blackshirts will always be remembered for marching on the Piazza San Sepolcro. During World War Two, Milan was subjected to heavy bombardment from Allied forces. Before American troops could arrive to liberate the city, Italian resistance members took over the city and executed Mussolini, along with some of his government. During the post-war decades, Milan attracted waves of immigrants, mainly from the more rural areas of southern Italy. The city subsequently became part of a boom to the local economy and this enabled factories to be rebuilt, along with modern high rises. Such boom years were tempered by social unrest and terrorism during the late sixties and seventies. More recently, developments have included a new financial district called Porta Nuova.